I’m hearing stories today of it being too cold to run. I can see that for the east coast. The national news is making a big deal out of their freezing temperatures and foot of fluffy snow. They should stay safe indoors for the weekend. Of course that advice doesn’t apply to Colorado. The entire first week of December was below zero. I ran a 5K race at -1°. Planes didn’t stop flying and we didn’t make national news. We are Colorado. It’s a bit chilly today – about 15° with wind chill. And we have a few inches of fresh powder. 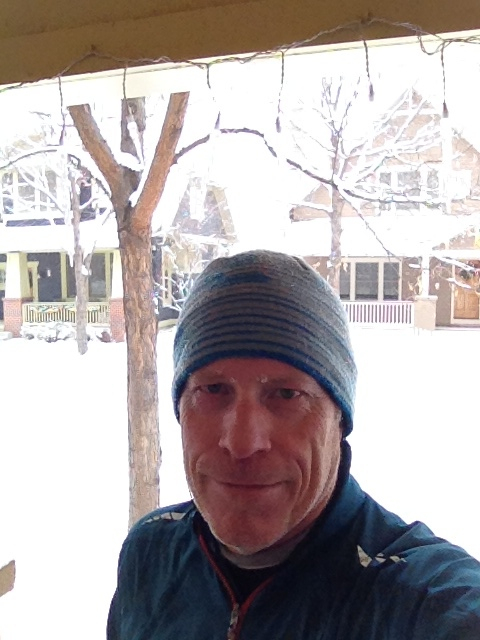 After seeing a facebook update from the neighborhood ladies about their early morning run, I geared up for an 8 miler. Gearing up for a deep snow run means gaiters. I wore my long pair. Of course I wore mittens but ran half the route without them as I was fairly warm when the wind was at my back. An 8 mile an hour wind is right about the barrier to a run’s enjoyability. Over 10 miles an hour can overwhelm the warmth of the Colorado sun. Tomorrow won’t be as pleasant but today really is decent running weather. Get out there! We don’t have snow – we just have ‘fridge weather’ 5/7degrees Celsius with ran/wind and sometimes just sun. I have yet to run in the snow, if we get it, its snow for a day, and a ice for the rest of the time. I can just envision sliding over!